Every March, as the first earthy smells of spring waft through the air, I home in like a pigeon on a place called Fruitgrowers Reservoir. There, by the shallow waters below western Colorado’s Grand Mesa, I absorb the sights and sounds of an eclectic menagerie of avian life. And I ponder how such a domesticated place can feel so wonderfully wild. Wild horses on the lower Salt River below Saguaro Lake in Arizona’s Tonto National Forest. The three bald eagles landing on that patch of ice? Definitely wild. But the scrap of fish they’re arguing over — a perch, perhaps? — is an introduced species. Those sandhill cranes legging it along the shore? Wild, but part of a non-migratory flock that survives the increasingly warm Colorado winters on cornfield stubble. And the ugly waterfowl making a ruckus in the reeds? Feral descendants of Muscovy ducks, a species native to South and Central America but now found on ponds all over the world, courtesy of human beings. Can you love a Muscovy duck the same way you love a bald eagle? I have always been drawn to native species. Which leaves me in a bit of a quandary with horses, the subject of our cover feature. The ancestors of modern horses disappeared from North America 10,000 years ago. In the 1500s, Spanish colonizers reintroduced horses into New Mexico, and by the late 1800s, as many as 2 million mustangs may have roamed the West. Today, Debbie Weingarten reports, most of the remaining “wild” horses — estimated to number in the tens of thousands — are caught in the middle of a debate that is more than semantic. 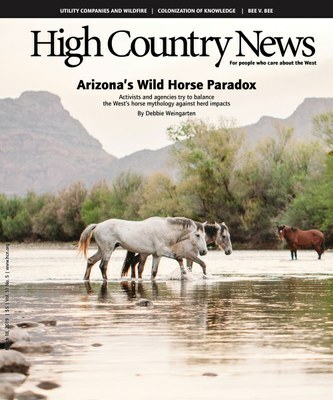 Public-land managers view the herd along Arizona’s Salt River as exotic livestock that trample soil and native plants and pose a danger to boaters and hikers, while horse advocates insist they are historically significant wild natives that should be allowed to roam freely. Fortunately, the two sides seem to have found a middle path that provides a management role for all. There is no middle path yet for the three-decades-old debate over the name of Northern California’s Dixie School District. As Wayne Hare, the HCN board member who produces our “A Civil Conversation” series, writes, some Marin County residents are perfectly happy with the name, while others see it as a painful reminder of slavery and racism. The school board rejected alternative names in February, but Hare believes it’s not too late for the area to choose to honor the experience of its few African-American citizens. And finally, we hope you enjoy the essay and photo spread about the Western gay rodeo circuit in the 1980s, 1990s and today. As Assistant Editor Emily Benson notes, Blake Little’s photos reveal both the violence of the sport and the tenderness of the people involved. The West, it seems, is a big enough place to hold a host of contradictions.